We are happy to announce project import from CSV to Breeze. Now you can import all your spreadsheet based projects to Breeze and manage them efficiently. The importer works very simply and you don't need to map anything. Just use the CSV template to get started. You can set all the task options from the CSV: name, description, list, swimlane, due dates, statuses, tags, assign, and custom fields. If you are using Excel, Google Sheets, Pages, LibreOffice, OpenOffice or any other modern spreadsheet tool then you'll have the option to save the file as CSV. Do this before trying to upload the file to Breeze. After uploading the CSV file the system creates all the tasks for you. Another way to import your projects to Breeze is to use the task import feature. It has been available for a while but you might have not noticed it. You can Just copy and paste text to the quick task creation input box and we'll create the tasks for you. It's a handy way to import old tasks, quickly create multiple tasks, or migrate from other applications. When you paste text into the new task input box then we'll create a task for each new line of text. You can also use the shortcuts to @assign, #tag and assign to !list. The copy and paste is not limited to spreadsheets, you can paste text from anywhere - Web browser, Word document, email, plain text and more. 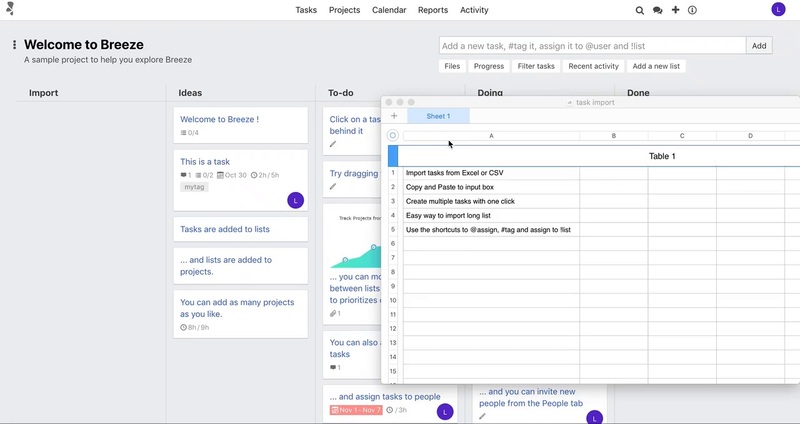 You can also import to-dos to your projects the same way as tasks. To import to-dos, first create a new to-do list and then paste your to-dos to a new to-do input box. It works the same way as task imported - every new line in the pasted text is added as a to-do. You can always choose to create one to-do when you paste the text. Simply click on the cancel option in the confirmation popover. We hope that the new project importer functionality helps you move away from tracking your projects in spreadsheets. Together with the task and to-do importer you can quickly move to a much better system. 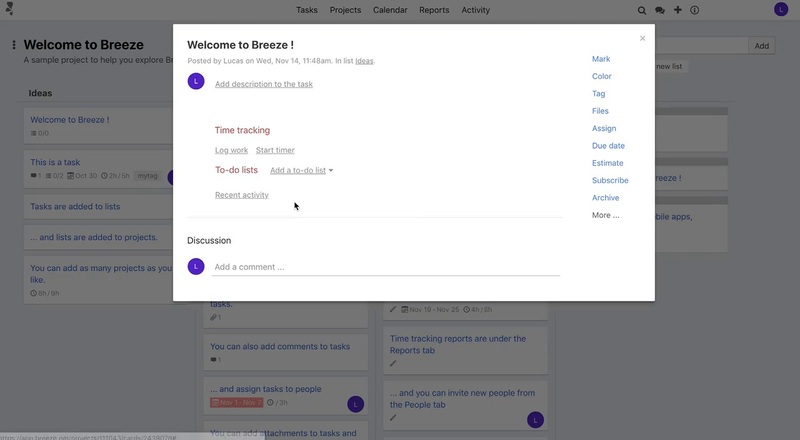 Breeze will help you track your projects more dynamically and communicate with your team.